Vapamore clearly isn’t the type to sit back and relax after a product launch. Hot on the heels of the Vapamore Forza, which we reviewed very favorably in July, is the all-new Vapamore MR-75 Amico. The Amico is a much smaller and much more consumer-oriented steamer. While the Forza serves as Vapamore’s hefty commercial powerhouse, and the MR-100 Primo is the versatile mid-end solution, the Amico serves as a simpler and more compact home bed bug steamer. Vapamore sacrificed some tank capacity and steam pressure to make the Amico as lightweight and affordable as possible. Is this sleek new hand-held steamer the right balance between power and portability, or were too many compromises made? Let’s find out. The Amico barely tips the scales at just three and a half pounds, and is a little over a foot tall. It’s not quite small enough to fit in a pocket, but it’s easy to tuck away in the closet when you’re done using it. The steamer and its 15 accessories can fit comfortably in the included carrying case, making travel and organization a breeze. As with previous Vapamore products, we were exceptionally impressed with the Amico’s build quality. While the body is mostly plastic, unlike the sturdy metal of the Forza, all of the hardware felt tight and sturdy. This isn’t a commercial machine that’s going to be banging around in the back of a work van – this is a lightweight home steamer, and the construction suits the role nicely. The simplistic controls (or lack thereof) were another indication of the MR-75’s intended purpose. All there is to fiddle with is a water cap and a trigger. No dials, switches, or fuses to fuss with – just fill her up, plug her in, and pull the trigger. It doesn’t get much more minimalistic than this without making things really awkward. Anyone can use the Amico, and that’s what industrial design is all about. It doesn’t really matter how well-built and portable a product is if it doesn’t get the job done, right? As it turns out, there’s not much to worry about when it comes to killing bed bugs with the Amico, provided you’re aware of a couple of convenience shortcomings. We’ll get to those in a minute, though. The Amico is capable of about 43 PSI, and produces steam up to 200 degrees at the tip. These specs barely meet our minimum recommended specs, but they’re more than enough to ensure that bed bugs are killed on contact. We were especially impressed by how quickly the boiler heated the tank: just over four minutes after we filled the tank, we were ready to start steaming. This is much faster than most larger steamers, regardless of the price point. There is one big downside when you scale down to a bed bug steamer of this size: the Amico’s tank holds less than a cup of water at a time. That’s only enough water to steam for up to about 10 minutes. Between refills, you may have to wait for the body to cool down a bit, and then you’ll have to wait that 4 minutes for the boiler to heat up the refilled tank. When steaming for bed bugs, you have to be slow and thorough, covering every crack and crevice where bed bugs are suspected. Between the floors, walls, mattress, box spring, and any upholstered furniture, you’re probably looking at 2-4 hours of steaming in the average bedroom. That means you have a lot of refilling to do with the Amico. The Amico completes the current Vapamore steamer lineup nicely, complementing the mid-range MR-100 Primo and the commercial MR-1000 Forza. It’s the smallest and most affordable of the three without skimping on the power needed to kill bed bugs effectively. 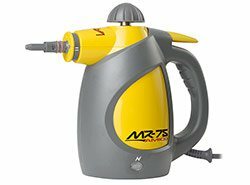 If you’re willing to trade some capacity and steam time for plenty of power in a very small package, the Vapamore MR-75 Amico is a great buy. It’s well designed, easy to use, and powerful enough to kill bed bugs on contact. For most people looking for an affordable and minimalistic bed bug steamer, the Amico is as good as it gets. If you’re looking for something with more capacity, you’ll probably need a larger steamer, like the best-selling MR-100 Primo. All things considered, we happily recommend the Amico, which will be ready to ship by the middle of September.